Walking our dog after the rain had swept through I noticed, caught in the shrubs along the drainage ditch plastic shopping bags caught in their branches. Looking more closely I realized that most of them had been there for some time, dirty, tattered, deteriorating from sun, mud, wind and rain. They have no value. Later in the day after paying for my purchase the sales clerk placed in another plastic bag not unlike those along the ditch back. That bag placed on the seat of my car continued to serve a purpose. That bag contained something important and was needed until the contents were safely home. With a new year has come the ever renewed resolution to take better care of our bodies. 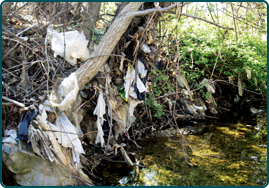 In some ways our bodies are like those plastic bags. Their real value is not in the bag but in what they contain. Our bodies are NOT us. Our bodies DO serve the purpose of containing “us”, holding us, keeping us alive in this world and able to do what we were put here to do. Sooner or later, these bodies fulfill their responsibility and are set aside. We call this death, passing away, or just “passing”. We may spend a moment looking at them but then they begin the same journey as those abandoned bags along the bank. Resolutions to work on our bodies are important. But infinitely more important is the care of our souls, the contents of “the bag”. Feed the body. Feed the soul.